After diplomatic disaster earlier this month, and controversial Iran deal, US Secretary of State returns to Israel to try again. US Secretary of State John Kerry will visit Israel next week and meet with Prime Minister Binyamin Netanyahu, in an attempt to appease the Jewish state over the Western power's controversial deal with Iran, AFP reports. Kerry will also travel to Ramallah for talks with Palestinian Authority (PA) Chairman Mahmoud Abbas as he tries to keep delicate Israeli-Palestinian peace negotiations on track, a US official said Wednesday. The talks have by and large been a failure, as Kerry's brash and threatening remarks - including an implied threat that a '"third intifada" would break out if talks fail - have been a diplomatic disaster for US-Israel relations. "Secretary Kerry will meet with Prime Minister Netanyahu to discuss a range of issues including Iran and the negotiations with the Palestinians," State Department spokeswoman Jen Psaki said. "Obviously, there remains a distrust with Iran about a range of issues. That hasn't changed, and our relationship on other levels outside of this first step agreement has not changed either," Psaki told reporters. 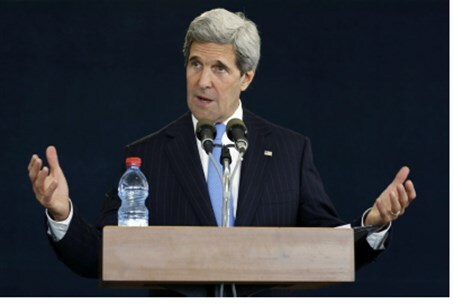 Kerry had also remained in close contact with the Israeli leadership during the negotiations with Iran, she stressed. "The reason we're so committed to a diplomatic path forward with Iran and the reason we're so committed to a direct negotiations been the Israelis and the Palestinians is because we're so concerned about Israel's security," Psaki told reporters. The temporary deal, forged this week between P5+1 and Iran in Geneva, exchanges a lifting of some sanctions on the Islamic Republic for a reduction in its nuclear weapons production program. Netanyahu called the agreement "a bad deal" and a "historic mistake," making clear that a military strike is still on the table to prevent a nuclear Iran. Netanyahu is sending his security advisor, Yossi Cohen, to Washington for talks on the details of the six-month interim accord. Jerusalem has been concerned that the deal will give Iran more time to stockpile even more nuclear weapons - this time unchecked and with international support; pressure on the US aims to help garner support for a permanent solution to follow the interim agreement.